During the Christmas holidays I reunited with my friend Nina after almost a year apart. She had moved back to South India after three years in the Netherlands and was in Amsterdam for a few days. Irresistibly, our catching up ended up revolving around food. The past year had been eventful for both of us, sometimes in quite challenging ways, yet we tacitly decided that we would spend our time together cooking and an found an ideal setting to our chats in my kitchen. One of the last time we met, before she left the Netherlands, I had taught her how to make gnocchi. 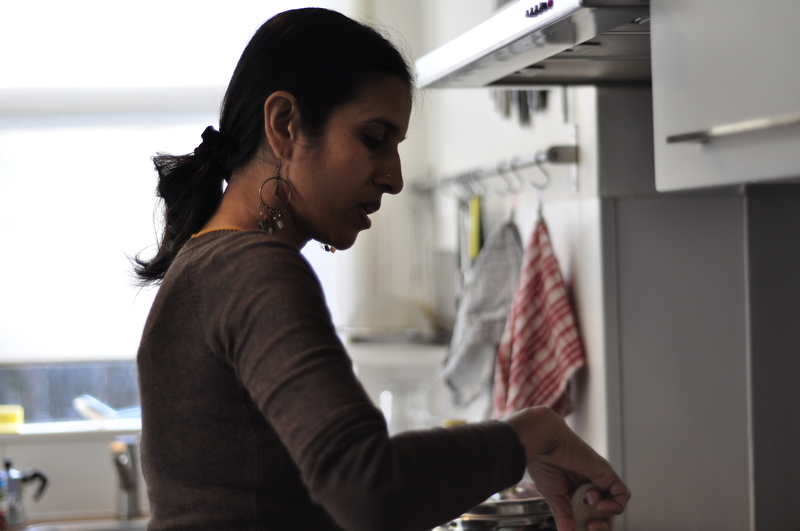 This time Nina taught me two mouthwatering and comforting Indian recipes. I am sharing them with As Soup As Possible readers in two videos. The first recipe is dal makhani, a richly flavoured dish from the Northern borders of India, based on urad dal (Indian black lentils) and kidney beans. When Nina sent me the long ingredient list I was a bit intimidated by its length and the presence of urad dal, a legume I had never encountered before, but then it struck me as a chance of discovering new flavours and even the quest for the uncommon ingredient became a fun adventure. I took the chance to visit an Indian store and discover a wealth of spices, legumes and other products that I had never considered cooking. 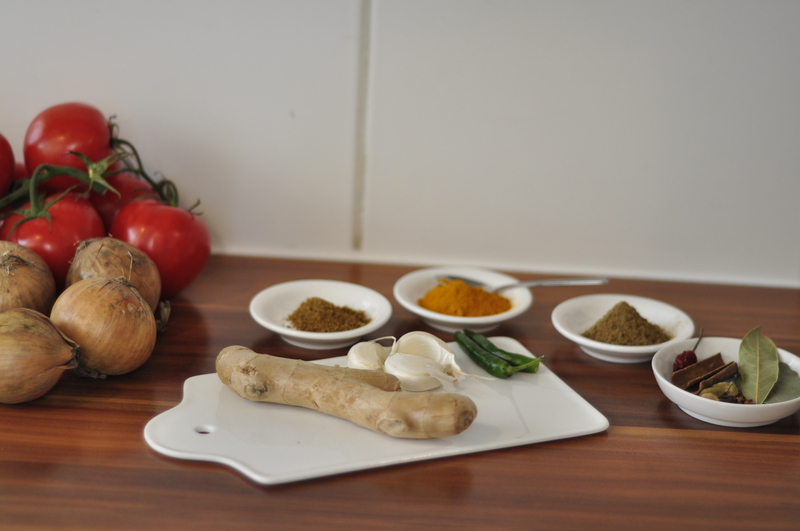 As for the spices, I realised that, with just the addition of a simple selection of Indian spices, your pantry enables you to cook plenty of new recipes. I came back from my shopping fancying the many culinary experiments ahead. To begin with, despite the long list of ingredients, the first recipe prepared by Nina is very easy to make. Her version of dal makhani is mildly spicy and, in my opinion, extremely enjoyable even for those who are not familiar with Indian cuisine and strong spicy flavours. If there isn’t an Indian shop in your town, get creative and try to replace urad dal with other legumes with a robust, aromatic flavour. 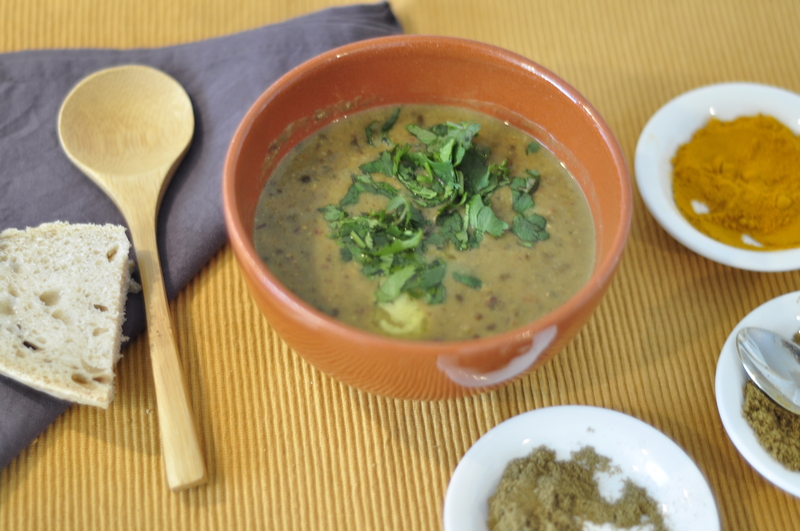 Dal makhani by Nina Subramani. Cooking time: about 50′ (using a pressure cooker). Soak the beans in abundant water overnight. In this case we used canned kidney beans, but you can soak urad dal and kidney beans together, for at least 8 hours, then rinse them throughly and drain them. Cook the legumes together with 2 bay leaves, cloves, turmeric and red chili in a pressure cooker for 4 to 5 “whistles”. Nina explained how most Indian recipes express cooking times in whistles. In fact, all of the websites I checked did. If you are not comfortable with that “measurement unit”, or if you don’t have a pressure cooker (reportedly a must-have in Indian kitchens), just cook the legumes until soft and creamy. It should take them about 1 hour in a regular cooking pot to reach the right texture. Blend onions, ginger and garlic into a paste and sauté it in oil with a bay leaf. Cook the paste for a few minutes, until it stops smelling like raw onions and becomes golden. Blend the tomatoes into a puree and add it to the paste. Stir and cook the mix until it thickens and it smells cooked. Add the legume mix from the pressure cooker. Keep cooking on a medium flame, and stir frequently to prevent the lentils from sticking to the bottom. When the mix is thick and smooth, add the cream. If you like hot flavours, you can infuse a small slitted green chili for a few minutes, before serving. Serve with a topping of butter and fresh coriander. Originally, dal makhani is served with naan (Indian bread) or steamed rice, but it’s very satisfying as a soup. 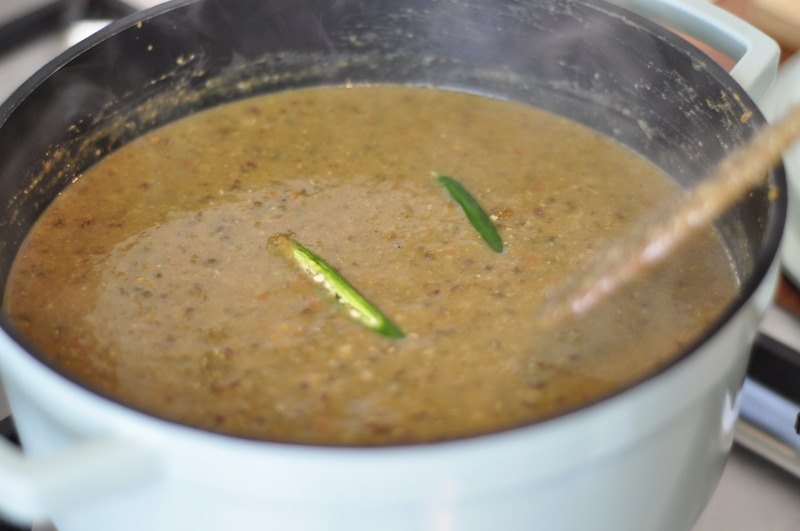 I hope you enjoy the surprising and multilayered flavour of dal makhani as much as I did. Feel free to share your experience in the comment section. Special thanks to my friend Nina Subramani for this culinary experience. Previous PostThe Companionship Of The Dough. Next PostRefugees in Mokum (and a bowl of soup).